Contacts are part of the Phone app and the layout is pretty standard - you get a list of all contacts sorted alphabetically with an alphabet scroll so you can quickly jump to a letter. Quick contacts are available too for easy access to some features. Contacts can be synced with multiple services, including Google's own, Exchange accounts, Facebook, Twitter and others. Viewing an individual contact is pretty standard too, except the Contact History option, which brings up a popup with the communication history with that contact. You can add new phonebook fields besides the preset ones. There’s no limit to the fields you can add to a contact. You can also link contacts, which puts someone's information from the multiple services into a single, combined entry. You can also star contacts so they go into the Favorites tab of the Phone app or organize them into groups. The Motorola RAZR didn’t have any reception issues while in a call and the sound was loud and clear. 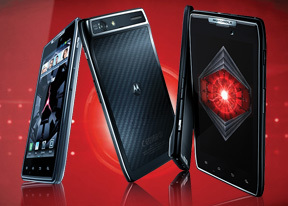 The Motorola RAZR also features a secondary microphone to suppress ambient noise during calls. Smart dialing is enabled on the RAZR, which is great as it spares you the time to go into your phonebook or a specific contact widget to find a contact. It shows only one matching contact at a time - you can use the down arrow to reveal all the suggestions. Voice commands are here too (a custom Motorola job), available through a handy shortcut in the dialer. You can use them to dial, send a message play a song and a few other options. A press and hold on the Search key will bring up the default Android voice command feature. One feature we missed was the turn to mute functionality. What you can do is make the phone read out the caller ID for an incoming call, assign custom ringtones to contacts or send their calls straight to voicemail. We ran our traditional loudspeaker test on the Motorola RAZR. The handset rated as Very Good and it's vibration was quite strong too. You shouldn’t have issues hearing it even in louder environments. Motorola's messaging app is pretty powerful - it combines a unified inbox, standard text messaging, Gmail, Facebook and Twitter. The SMS and MMS department (called Text Messaging) is pretty much your ordinary Android – threaded messaging is enabled and the message composer has a neat and simple interface. The tap-to-compose box starts off with two lines but it will expand as you go. If need be, it will even fill the whole screen, which is really nice for longer texts. You also get a quick character counter (and message part counter) as you type. Converting an SMS to MMS is pretty simple - you just add a photo or an audio file to go with the text or you can choose to go into a full-blown MMS editor, depending on your needs. Twitter and Facebook also get inboxes in the Messaging app - here you'll find only messages addressed to you, rather than all status updates from your contacts. For email there are the Gmail app and a generic email app. In Gmail, batch operations are supported and allow multiple emails to be archived, labeled or deleted. You can enable push email or schedule automatic updates. There’s an option to only sync over Wi-Fi, which is sure to save you data charges. The Messaging app also works for Gmail and other services. It supports batch operations along with conversation view too - it groups emails into a single line and when you tap it, it brings up a list of all emails in the conversation (in preview mode only, it won't display the full emails in the list as the Gmail app would). A combined inbox is available in the Messaging app. You can hide the social networking stuff if you want to use the combined inbox for serious business. The Messaging app supports simple gesture actions. You can set an action for left-to-right and right-to-left swipes on emails in the list. Available actions are mark as read/unread, flag/unflag, move or delete. Later, you can view unread only or flagged emails only. Other available views can show you only emails with attachments or sort emails by importance rather than date. You can set the app to show two, three or four lines of preview for each email (the top line is always taken up by the sender so you really get to see one, two or three lines of the email body). For text input on the Motorola RAZR you get two options - the Swype keyboard (enabled by default) or the standard Motorola QWERTY keyboard. There's handwriting recognition, which is useful for entering Chinese characters. Our RAZR had another keyboard preinstalled, but it didn’t really seem like a viable option - a poorly implemented iOS keyboard lookalike. Typing is pretty comfortable as the keyboard is multitouch capable and that it's working on a big screen helps out too. You can go to landscape mode if you want it even bigger.